In the war of the Eye Care Professional vs the Internet, this article attempts to look at some of the key battle grounds and how the Eye Care Professional, in particular the Independent Eye Care Professional can not only fight and neuter the threat posed by the online trading channel, but also differentiate and significantly win, highlighting those areas that the internet can never compete with professional expertise on. “No way”, would be the natural response to that. “Impossible to imagine how the internet could ever do what we do for our patients”. Yet a closer look at the question can yield some alarming warning signs that suggest the landscape is dramatically changing, and those not equipped to deal with it could find the future looking very bleak. Just look at “online doctoring” and the plethora of information you can now access on almost any medical condition or disease, with doctors on standby for consultations, discussion forums and of course the power of social media in “arbitrary peer based medical diagnosis” leading to much self-prescription as to the right course of action. At what point in our dynamic and ever faster changing lifestyles do we engage the “traditional” doctor. I surely exaggerate the point a little here, but the general trend is there and ever accelerating. A simple google search for “contact lenses” or a specific brand produces a plethora of algorithm optimised search results – very few of them the brands own website. Online retailers, with the benefit of not providing specialist support services or owning expensive high street buildings, simply invest hard to ensure that they are the first “search hit” the patient sees once on google. And they then compete for your business. “cheap lenses online, only £11.99, lenses from £x, next day delivery guaranteed” and so on. So the patient really is a winner – they pay less, have fast delivery and never need to leave the safety of their own sofa. And if something goes wrong for any reason, I can google the condition, find the advice online, or worst case scenario go see the Doctor. “At the end of the day you will always need to see an Eye Care Professional to get your eyes tested”. We all know that eye care professional advice recommends having your eyes tested once every 2 years, but it is equally appreciated that so many patients are non compliant with the professional advice, that the average may well be much longer! And the obvious question then is, “how long until I can do my own eye test from home with a downloaded app? So do I really need to go the Optician to get my eyes tested? It’s already here, in the USA at least, so natural to believe that it is just a matter of time before the platform exports to other areas of the world. 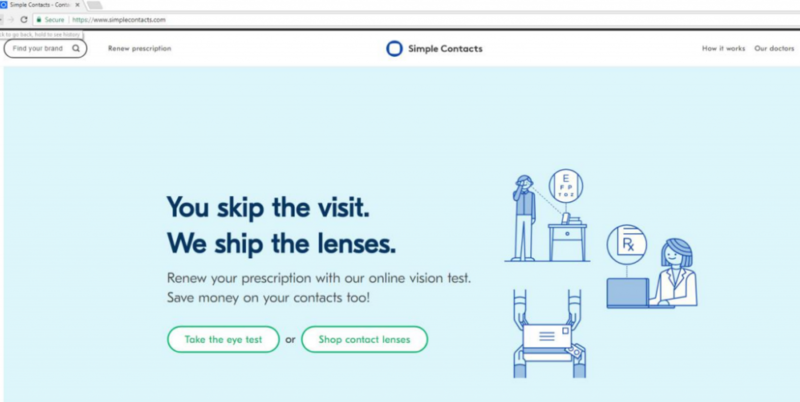 Here you can skip the visit to the Eye Doctor, take your vision test online and then ship your contact lenses directly to your own home. The patient doesn’t even need to leave the arm chair. So where does this leave us? For one – the world is changing and changing at an ever faster rate, so as an Optical profession we can accept it and suffer the future as it is handled to us, or we can change the rules of the game, differentiate and win, with patient outcome firmly at the heart as a guiding principle. 1. Don’t try to compete with the internet. They are better at what they do and they will beat you with significantly more experience. Indeed, as smaller Independent practices and groups, don’t even try to complete with much larger national chains, again their model is built for one value proposition, and you cannot beat them at that either. 2. Showcase your clinical skill to the patient – demonstrating that what they pay for is so much more than just a “product”. Explain what you are doing and why, talk to them about the uniqueness and specialness of their eyes, shapes and vision requirements. Talk about different products, their engineering, manufacturing and qualities. 3. Be the knowledge centre of expertise – so that the first place the patient looks for advice and guidance isn’t google, it’s your website. Cover topics from kids eye care to the golden years, from simple vision correction changes and eye diseases and more complex conditions. Make sure that your website is the first place your patient goes for advice and information. 5. Go the extra mile – remove the “gate keepers”. What about handing out your individual email to your patients and feel free to contact in case of any concerns, questions etc… “that personal support”. What about adding “out of hours” services for when that “emergency advice or reassurance is needed”, and what about a mobile service – taking eye care to the patient. Little things can be very effective in positioning you as the first point of contact for all eye related queries. 7. Supply only products from companies that are aligned to your values and goals, this includes those that sell exclusively through the eye care professional and not to the internet. Your clinical time should be rewarded with the product sale in practice. Click here to find out how mark’ennovy can help support you in your practice and service differentiation, and if you have any ideas on what we can do more, then please get in touch with us here. mark’ennovy is dedicated to the eye care professional. That’s why we only sell through the profession and not to the internet, and it’s why we have a team of dedicated trained Opticians on the phone to support. We believe each and every mark’ennovy contact lens starts and ends with you, the Eye Care Professional, from the first consultation to a successful final fit.